Wonderful testimony from the great state of Virginia!! "This past Friday, during our Salty Sidewalks workshop, we were sharing stories of our salt leaks. One of our ladies told of going into a very popular Mexican restaurant in our town, and leaving 3 bookmarks in the restroom. She came out and went back to her seat. A few minutes later, one of the workers approached her, asking if she was the one who left bookmarks in the restroom. My friend replied, that yes, she had done that. Not knowing what might happen next, the worker asked if she had any more, that she could give to her friends. PTL! Also, last week, our car battery went dead in the doctor's office parking lot. A sweet lady came out to go to her car, and seeing our hood up, asked if we needed a jump. My husband told her we did. She came back with jumper cables. After our car was running again, I gave her a bookmark. She was SO happy! She held it up and said, "I will remember this forever!" Only eternity will reveal the impact it has in this world"!! I RECEIVED A SALTY SIDEWALKS BOOKMARK LAST NIGHT IN A HARRIS TEETER BATHROOM IN MATTHEWS NC. WAS IN LOVE WITH IT.. WENT INTO THE WEBSITE AND JOINED. Hi, my name is Vicki and I'm not entirely sure what this is about but following the instructions I found. I found this bookmark in the cancer treatment room at my local hospital in Chattanooga. I was with my my sister who is undergoing treatments for multiple myeloma. We have been coming here for the last 16 months and this is the first time I've ever found anything of this kind. It's "discovery" couldn't have been more encouraging or at a better timing. The day this was found, was my sister's last treatment as she is now receiving hospice services. Our family is crushed, and I myself am at an all time low. I've been to church most of my life but have quit going due to much hypocrisy and unkind, fake "christians" that seem the live the exact opposite of what they preach. This little bookmark was a refreshing reminder that there are still some "real" Christians out there. Thank you to whoever did this. We were so blessed to be able to bless the women of the "Living Loved" retreat. Each woman was able to pick a salt leak out that spoke to them. One sweet woman, was so enamored with the idea of Salty Sidewalks, that she took all of the extra- promising that her husband, who is a trucker- would spread them out across the US. Yay God ----love that they were willing to shake some salt onto our city streets!!! Good morning, friends! I would like to send out a huge thank you to *Salty Sidewalks for the gorgeous salt leaks! I wanted to share it with you all. The picture on the front of the card is SO meaningful to me. Most of you know, that my son, is also a member here. It has been such a joy to work on salt leaks together. He is such a special young man with a heart for God and compassion for people. He was this way very early on. There was a period of time in which I had stopped going to church entirely for several years when he was young. HE is the reason I went back! He pleaded with me. Even when I was not the finest example during those years, he was an example to me, and kept drawing my focus to God. I encouraged these traits in him, but my life wasn't matching what I was conveying. Of course, that has all changed now. I rededicated my life to the Lord many years ago, and I have not looked back. So, I just wanted to explain why this salt leak means so very much to me!! Isn't it gorgeous? The tags too! Lovely! The keychain is now on my backpack and there it will stay. Seeing somebody leave art around helped me not be so nervous for my first french class. GOD IS IN THE DETAILS!!! 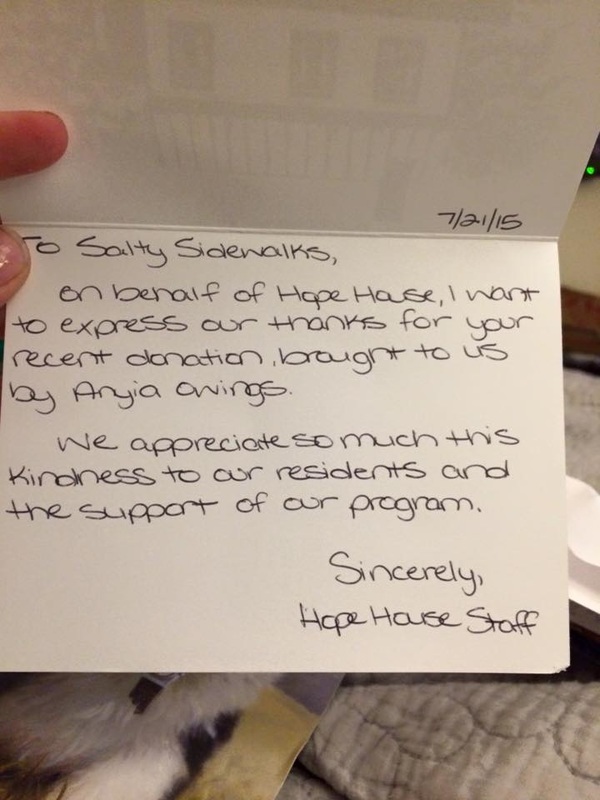 In March, we had a lovely lady, Anyia, join Salty Sidewalks. Not long after, her friend, Beth, came on board as well. Immediately, they became actively involved in creating artwork (salt leaks) to share the Gospel. They have reached out in a huge way. They have donated creative artwork with Scriptures to a pregnancy center, as well as abandoned so many items, I’ve lost count! As an observer and fellow member, I was continually in awe of their obedience to God, their humble spirits, and sincere desire to reach others with the love of God. They were and continue to be so inspiring. In April, I was facing some personal struggles that were a distraction to me. Although I had been actively participating myself in Salty Sidewalks, I found myself in the middle of a dry spot. 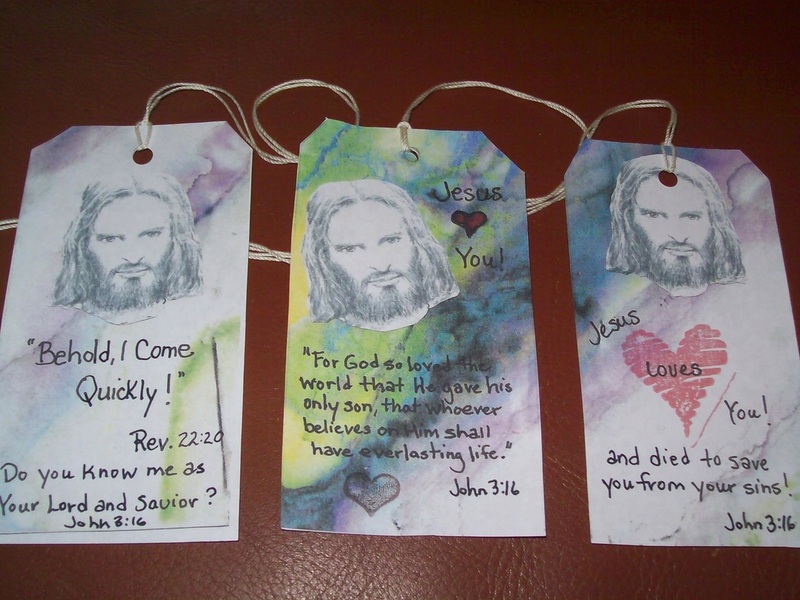 I had allowed the distractions to become a hindrance to reaching out with my artwork to share God’s love. I was dismayed by this, and I decided to do something. I messaged both Beth and Anyia at the same time. I thanked them for their dedication and inspiration. I also requested though that they would pray for me for renewed strength and passion for this ministry. Sometimes, reaching out in this way is hard for me, and I really didn’t know Beth and Anyia very well. They both accepted me where I was at with arms wide open. A beautiful thing began to take place. We began to pray for each other in earnest. We were sharing deep thoughts, and a friendship as sisters in Christ was born. Much to my amazement, one day, Beth sent me a photo of a salt leak that she was given at The Encouragement Café-Unspeakable Joy Conference in NC in March. I had no clue she had one! I didn’t know that is how she learned of this ministry. Then, Anyia sent me a photo of one given to her at this same conference. Both were asking if I knew who had made them. They are both pictured below. Salty Sidewalks members were given a fantastic opportunity to reach out to women at this conference. With help from many members, we were able to send off enough items with Scripture and uplifting thoughts to offer as gifts freely to every woman who desired one. I participated in this, and I prayed over each item I worked on and prayed about what Scriptures or encouraging thoughts to include. When I saw these photos that Beth and Anyia sent me, the tears began to flow. You see, I was the one who had made them. I felt the presence of God so strongly, and a deep sense of humility and gratitude. 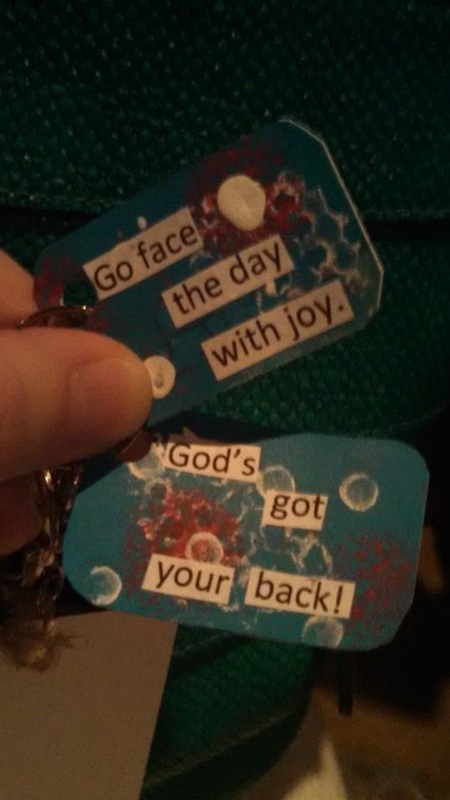 Beth shared with me that her cards spoke to her because of a period of depression that God had helped her get through, and that she was able to share a photo of her cards with new believers, and it encouraged them. 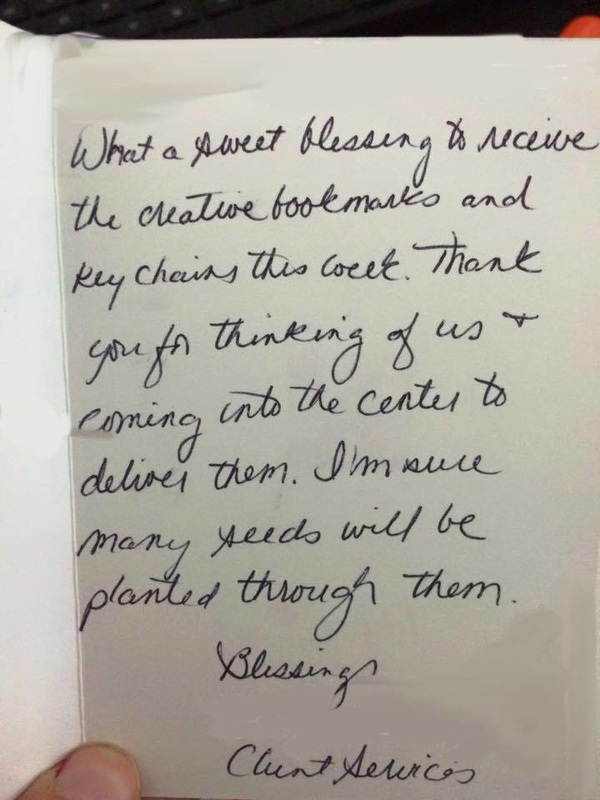 She and Anyia have also shared that in receiving these gifts, they too were inspired to join the Salty Sidewalks ministry, and to begin reaching the lost, the hurting, the broken through their artwork. I do not believe there are coincidences with God. 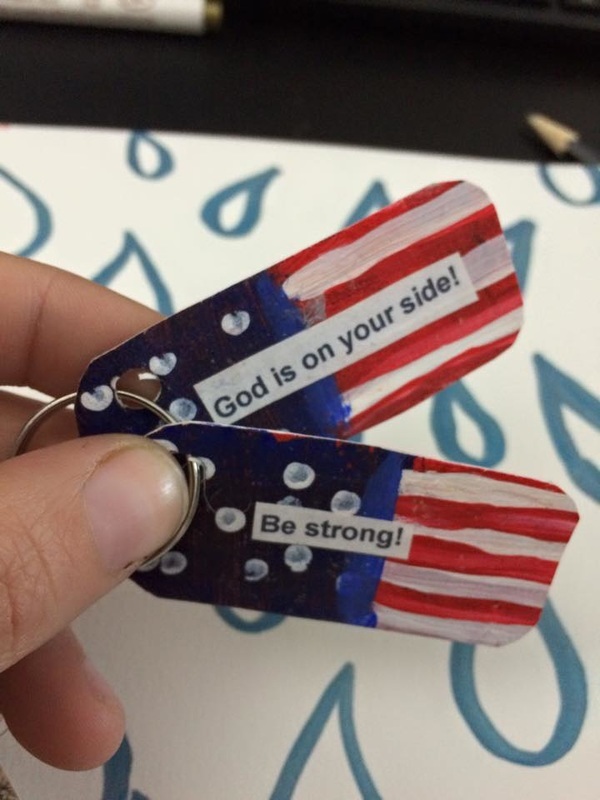 God used two little key ring cards to bring inspiration to Beth and Anyia’s hearts for ministy, to uplift and encourage them, and to become my friends and prayer partners too. Indeed, my desire to keep reaching out in this way has been renewed. Only God could have woven all of these details together to create our story. For this, we all give Him honor and praise! I have a sweet little Salt Intake story for you!! I know many of you read about the donations of cards and tags that were given to the nursing home where my grandmother, Dorothy, resides. The activities director there, Lynette, personally handed out each card and tag as promised. For those who couldn't see well, she held them up close and read them aloud. I had a nice surprise today! My Dad dropped in, handed me a folder and said..."Lynette asked me to give this to you". Inside was a lovely thank you note saying how much she really appreciated the gifts and how wonderful it was to share them with the patients. Inside the folder, was a beautiful 8x10 picture of my grandmother that Lynette had made for me! The Milford High School students put on a "prom" at the nursing home each year. It's the cutest thing. They arrive early to help all the residents who wish to attend dress up, and they even help the ladies with hair and make-up! They decorate the recreation room beautifully. It's such a fantastic thing. I thought I'd share the picture with you. It's a tad blurry (sorry). It's of my grandmother with a handsome gentleman at last year's prom! She has really suffered major health setbacks in the past year, but Lynette wrote on a sticky note that she is STILL insisting on making it to the prom!!! I am SO grateful. I don't have too many photos of her, certainly nothing this large. What a great unexpected blessing it was! Just thought this might be a fun story to share. Incredible Testimony From Tawa, New Zealand!! I received a gift which I found in the Salvation Army Store in Tawa. Enclosed was a painting by Gerda Smit. There are two things I would like to share. Currently I am going through very uncertain times in my life. 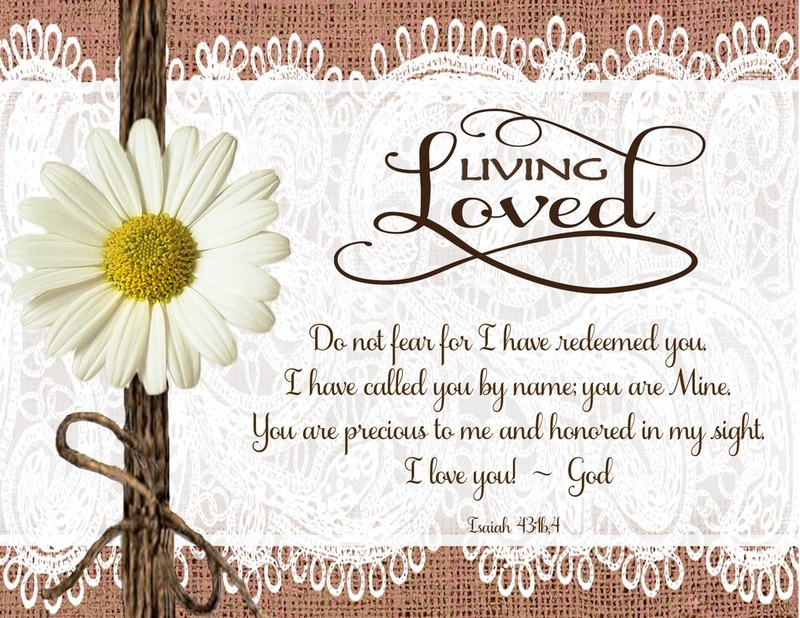 Enclosed was a card quoting Isaiah 41.10, do not be afraid, for I am with you. This was a timely reminder for me that god has the outcome firmly in his hand and for me to turn the problem over to him. The second most amazing thing is that I had a Gerda Smit painting already, which went missing at a removal firm when I shifted at the end of last year. I had let the company know about it and they were searching for it. I came home, after receiving this gift, to an email from the company to say that they had found my painting and would deliver it this morning. It has just arrived in perfect condition. Now that's amazing and god did indeed have that also in his hand. This painting is especially precious to me as it has a huge white butterfly in it with what appears to be a woman wearing a hat looking down from the sky...there's a lot more as well. You see my mother lived with me for 18 years until her death and she said to me, when she came under palliative care, that whenever I saw a butterfly after she was gone I should think of her. The woman wearing the hat, in that painting, was wearing a hat exactly the same as my mother wore and as it appeared she was looking down from the heavens - I knew that painting was done just for me when I bought it. I did not purchase it new however which is amazing as I couldn't have commissioned a painting more relevant to me. I purchased it from the same store where I found your little gift! As soon as I saw the painting I purchased in this shop, I felt it had been placed there just for me to buy, in the same way I know the little gift to find was in the same shop just for me to find. The painting I bought was purchased about ten days after my mothers death so again you will see why it was so precious to me. 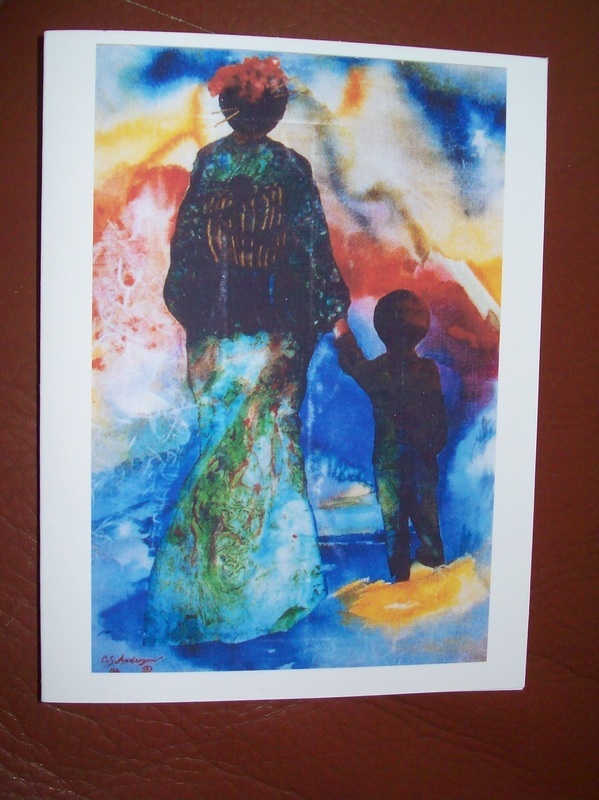 Please would you forward a copy of my email to Gerda with a big thank you for the wee painting and encouragement that God has everything in his hands. I also believe that the painting I purchased was a god inspired one and although it sold to someone else before me, they chose just the right moment to give it to the Salvation Army as a donation for their family store, where I purchased it. If God is for us who indeed can be against us. they’ll complete the assignment I gave"
So the salt of the Word was given, and the taken in by the recipient....through the Holy Spirit it completed the very work that the Lord intended.....then WE get to delight in the outcome......Ok, ok, enough guessing - ready heres our intake story for today: ".......it is a beautiful scarf and tomorrow is my 40TH BDAY!!....... Anyway...what an awesome ministry..." So, how sweet is our God, that this precious woman would feel a gentle kiss, an intimate touch from her Savior...on a day that many woman dread. Yeah, our God loves us that much and wants us to know it - every minute of every day!! Happy Birthday dear sister!! 12/4/2014 "I have a WAY encouraging thing to share today! I signed up two days ago at Adopt a US soldier. I received info today about the soldier. I cannot tell of too many details online, as it is restricted, but I CAN tell you this!! It's incredible! I received an email already in which the soldier said (and I quote)..."I can't really think of anything I need, but if at all possible, I would like someone to correspond with weekly. I would also perhaps like to receive some drawings or handmade artwork to decorate my office because it can get depressing. I also want to share it with my fellow soldiers to bring a little light to this dull environment." WHAT???!!! I did feel strongly that God wanted me to do this, and that it was to be a Salty Sidewalk expedition. Did I expect a specific request for handmade artwork??!! No, but we sure do have a big God who knows and sees all! Please pray with me while I'm creating for this soldier who is defending our freedom that God will guide these hands, so I CAN bring His light into this environment!! Thank you!!!" "Today my prayer is a prayer of Thanksgiving...praises and awe in what He is doing through Salty Sidewalks - the blessings that we are witnessing --through making the artwork, reaching out and getting out of our comfort zones...we have been blessed beyond compare by entering into this creative space with the Lord and letting Him explode through our selected mediums.....as the testimonies start to roll in, I find myself crying - He is so faithful, He is so good, He is so in tune with our littlest details....Today I am overcome with gratitude for the God that we serve and for all of the hearts He has joined together to take on this Gospel- spreading -creative -army -movement- to- love- the -world- well!! <3"